On the banks of the Saone river is the city of Macon — a gateway between the South and North of Europe. Being in the region of Burgundy, Macon is known for its local wines. In particular, Chardonnay which accounts for two-thirds of the Maconnais wine produced. For wine aficionados, exploring the Maconnais-Beaujolais wine route should be on your itinerary! There’s also a wine fair in Macon that takes place yearly in April. 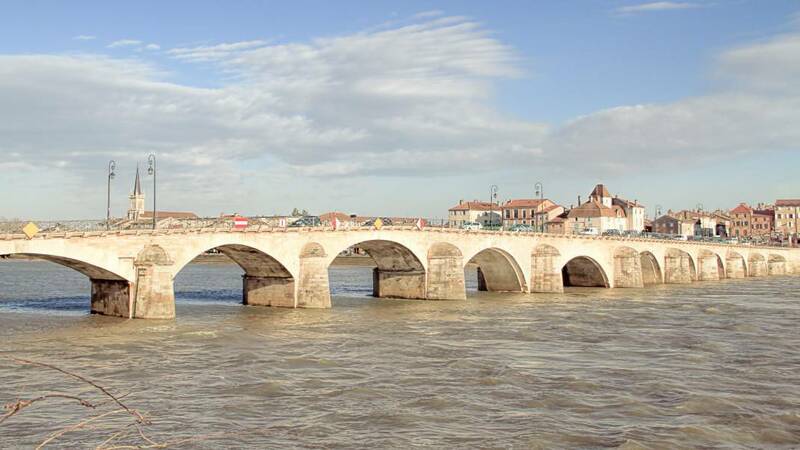 As you cross the Saone river on Pont Saint Laurent, keep in mind that it was among the few bridges of the region that was not destroyed during the Second World War. From its beautiful churches and medieval architecture to the Maison de Bois and Musee des Ursulines, Macon is full of heritage to explore. With its walls painted in vivid colours, this quaint city also gives us a taste of the mediterranean. It’s no surprise that poet and politician Alphonse de Lamartine, a key figure in the Romantic movement, was born and inspired here. Walk in his footsteps with the Lamartine Route that takes you all over Macon. The ideal time to enjoy trips to Maconnaise vineyards and explore the city of Macon is in the warmer months of June and July. Macon’s tourist office also organises guided tours from June to September. With markets held regularly on Saturdays, a weekend trip is perfect to soak up the delights of Macon. If you’re planning on doing a wine route or visiting multiple vineyards, it would be best to add an extra day to your trip. Being a small city, clothing in Macon is laid-back compared to Paris. Casual clothing appropriate to the seasons is all you need. Bear in mind that July’s average temperature is 21 degree celsius and you’d need an umbrella for the wet month of May. Built in the late 15th or early 16th century, La Maison de Bois (or the wooden house), full of intricate wooden carvings of men, monkeys and masked figures remains a timeless must-see. The medieval timber house lies in the heart of Macon and is the oldest building in town. The perfect spot to people watch, stop for a coffee here at their cafe-restaurant. Originally a convent, the spaces dedicated to the prehistoric era and fine arts were opened to the public in 1968. At the Musee des Ursulines, you’ll find something for everyone with exhibits on the history of wine to contemporary art. The second floor pays homage to local name Alphonse de Lamartine. For € 2.50, this experience is worth every cent! Walk in Alphonse de Lamartine’s shoes with a trip down the Lamartine route, spanning through the countryside that inspired him. Complete it with a visit to the Lamartine museum and the Chateau de Lamartine where he resided. You’ll also be able to see his completed literacy works. There’s also a heritage trail you can follow which shows you these places that were close to his heart. Trains from Paris Gare de Lyon takes one and a half hours to reach Macon Loche TGV which is about 10 KM outside of town. If you take a bus (Flixbus or OUIBUS) from Paris, it’ll take five and a half hours. Tickets are available online. There is no airport in Mâcon but you can easily reach it from Paris and Lyon! From Charles de Gaulle airport and Lyon Saint Exupery Airport, you can take a TGV straight to Macon-Loche. Macon is also accessible from the Orly Airport which is 380KM away. Paris and Marseille are both four hours away. Dijon and Lyon are an hour away. From Paris, take the A6 highway. For Dijon, take exit 28 to Macon Nord on the A6. If you’re coming from the South (Lyon or Marseille), take exit 29 to Macon Sud on the A6. Dine in a wine cellar at Le Carafe. With a menu that changes every week — you’re in for a delicious surprise! With a small amount of tables available, reservations are a must! Menus are constructed from daily local produce and is guarantee to satisfy. You’re in for a treat with the cuisine at this Michelin restaurant. It’s a great place for the family as there’s menus for children too! Within this building are modern rooms and beautifully decorated communal areas. Overlooking the Saône river, you’ll have a great view of Pont Saint-Laurent from here. The perfect place to stay to remain in Macon’s old town. This pink boutique hotel is on the riverwalk, surrounded by the Saône river and is in the heart of the city. It’s a 3 minute walk to Pont Saint-Laurent and a 6 minute walk to Musee Lamartine. An elegant B&B accommodation with a seasonal swimming pool, sauna and hammam — how ideal after a day of exploring Macon’s streets! With an excellent breakfast to start another day in Macon, what are you waiting for? Chateau de Pierreclos, known for their tours of its wine cellars and tastings of wines produced there is 10 minutes from Macon. For a budget-friendly alternative, head over to passionate wine-grower Jean Pierre Michel in Quintane. Fancy some artisanal craft? Head over to Couleurs et Lumieres for a 2-hour workshop in stained glasswork at 25€. Workshops are conducted in English on request. Visit Macon’s Jazz club, Le Crescent for an evening of good music. Their Jazz festival held in July has been a resident in Macon’s cultural calendar for over 10 years!